The essential dilemma about the internet the way it is this: We have had to give up privacy in order to get productivity. The volume of conversations that stem from privacy concerns and the lack of credible alternatives to remain private yet to be able to connect seems increasing. So much so, that the whole surge towards Blockchain based technology is often touted to hinge on its ability to solve that challenge. That for another day. In this post, at the center of it all is this question. Is it possible for a technology to promise both transparency and privacy? What is the optimal amount of transparency that’s required that is ‘just required’ for a transaction, without compromising privacy? Transparency and Privacy in tandem, increase likely solutions to many of the challenges we face today. Especially in the food industry. Have you looked at the label ‘organic’ on food items and ever wondered if it indeed was organic? Worse even, is it safe? The WHO estimates that 1 in 10 people become ill every year from eating contaminated food. With 4.2 lacs dying each year, as a result. Case in point: A nationwide outbreak of E coli in the USA (2006) was caused by bagged spinach. It took regulators two weeks to conduct the traceback and determine the exact source of the outbreak, as spinach. During those two weeks, many people got sick and one person died. Another Result: Tons of good spinach was wasted because we couldn’t tell the good from the bad. Fast forward to 2018 and nothing much has changed, except it’s gotten worse. Contamination from food has caused more people to get sick and heaps of good food to be wasted, in the effort to ensure more don’t get affected by the contamination. Product recalls are not very effective- they take time. And a ton of the good food along with the bad gets wasted because we are unable to tell the difference between the good and the bad. Walmart, Unilever, Nestle, etc are collaborating through the IBM Blockchain Food Trust Network. A TRANSPARENT system with supply chain visibility across these members and their ecosystems. The intent is zeroing down and localising a food contamination. The network is already showing results. Reducing the impact of food recalls. Limiting the number of people who get sick or die from foodborne illnesses. Walmart wanted to isolate a batch of mangoes. Trace them from their retail outlet to the farm. Leveraging blockchain it took them 2.2 seconds to do so. Without blockchain, this would take them 6 days, 18 hours and 26 minutes to identify the farm. Competitors coming together on a common platform to collaborate has always had hesitancy written all over it. ? After all competing with each other in the marketplace. Dilemmas range from sharing information and practices to exposing their key people to ‘outsiders’. Blockchain has a snug fit of providing the best of both worlds. Of exposing just enough and not anymore. That means, no compromising of trade secrets of companies while making information transparent. Blockchain ensures the ‘privacy’ of knowledge / know how/ process. Competitive advantages of organisations remain well within organisations and are not revealed on the network. This makes collaboration a lot less risky and more inviting. How can such a transparent system, open and accessible to all, ever be private? The clue lies in an interesting concept called Cryptography. Cryptography gives Blockchain the ability to share relevant inputs without revealing all. This works across industries and assets. Think of high-value assets, art or diamonds. Owners will go to any lengths to conceal their identity. Yet insurance companies struggle with Insurance fraud of such high-value items. These high-value assets are at times, fraudulently registered as stolen. The insurance companies pay out. The asset resurfaces at a different place. Registered with a new insurer and the same process of fraud repeated. Tired and at a loss, the Insurance companies have turned to Blockchain! They are leveraging the Privacy feature to conceal the identity of the asset owner. Sharing details of the payout with members of the Blockchain network makes it easy to detect fraud. Each asset is laser-inscribed with a digital ID making it easy to detect. Firms like Everledger have been working on this. 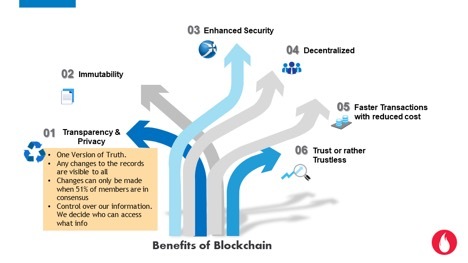 The benefits of Blockchain for end users and companies specifically through the twin lenses of Transparency and Privacy are as follows. For end users: It gives control of all our information and transactions to us. Who can access our details/what did they access/etc. There is one version of the truth. Which is visible and consistent with all the users. For companies: Apart from the benefits listed above, it allows them to include the end user in their entire sourcing and manufacturing process. This inclusion builds trust and an unparalleled brand value. Firms which already have a culture of transparency and trust and see the customer as an extension of their internal teams, Blockchain will be a lot natural. If not, there may be a distance to go.